Zotero is an open source tool used to collect, organize, cite and share research sources in the Linux distributions. Its searchable interface allows the users to add PDFs files, images, audio and video content, snapshots of web pages, indexes. Installation of Zotero in Ubuntu is explained in this article. First add the repository for installing the zotero. Then update the newly added repository with the following command. Now its time to install the zotero with below given command. 0 upgraded, 1 newly installed, 0 to remove and 30 not upgraded. Need to get 3,170 B of archives. Selecting previously unselected package zotero-standalone. > > >  Don' t forget to check out Qnotero, the Zotero sidekick! To open the zotero application, click on the Unity dash and type the app name in the search bar. Then click on the displayed icon. 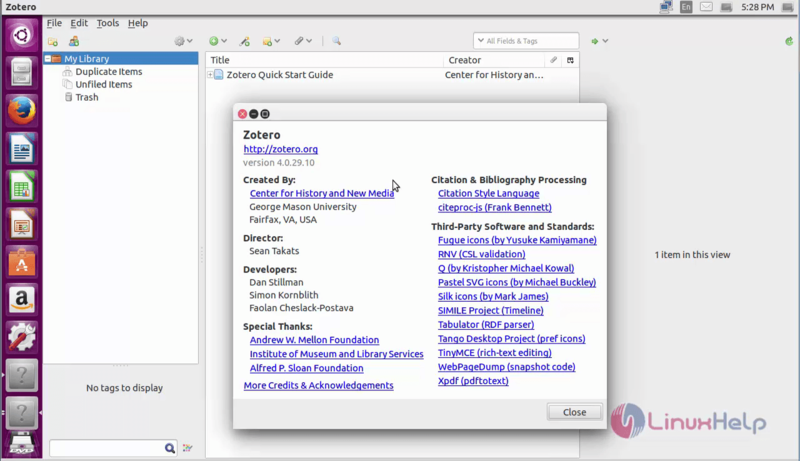 Now you can be able to view and access the zotero software. Run the following command to uninstall the Zotero. 0 upgraded, 0 newly installed, 1 to remove and 30 not upgraded. After this operation, 12.3 kB disk space will be freed. How do I pay for Zotero Storage? All major credit cards are accepted for payment. Institutions can also pay via bank transfer. How can I upgrade to a larger storage plan? If you choose to upgrade your storage subscription, the prorated balance on your existing account will be used to calculate the expiration of your new subscription. Example: You have 6 months left on a $20 2 GB subscription and decide to upgrade. When you purchase a storage subscription, you may choose to renew or not to renew automatically each year. You can cancel automatic renewal at any time from your storage settings. You'll also receive a reminder email when your subscription is expiring or about to renew automatically. How do I allocate storage between my personal library and my groups? Your personal library and any groups you own automatically draw their storage from your subscription. Groups not owned by you draw their storage from the group owner's subscription. How do I sign up for Zotero Storage? Simply visit your Zotero account profile and select a storage plan.